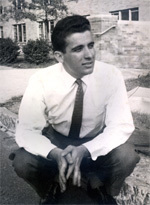 George Rubis emigrated from Greece to New York City as a teenager. He graduated from N.Y.U. with an engineering degree, and soon after married his sweetheart, Bertha. They settled in Englewood Cliffs in 1967, where they raised their three daughters, Stacy, Sophia, and Pauline. 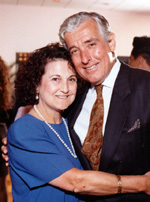 George participated in local community services, and was a long-standing member of the Englewood Cliffs Planning Board. In the mid-1970's, George took up jogging as a hobby - it quickly became his passion. Local residents could see him jogging the streets at least four days a week. 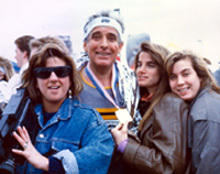 In 1981 George completed the New York City Marathon - the first of four marathons he would complete throughout the '80s and '90s. 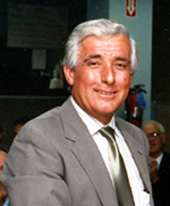 In 1997 George was looking forward to a retirement of travel, relaxation, and spending time with his family when he was tragically diagnosed with pancreatic cancer. This disease, known as "the silent killer", has a 99% mortality rate - the highest of any cancer. On September 5, 1998, after a valiant 15-month fight, George passed away at the age of 63. George's family invites you to join us in raising funds for Pancreatic Cancer Research at Johns Hopkins University. It is our deepest hope that our funding will aid in the development of an early detection test, successful treatment, and a cure for this insidious disease. Run for George is dedicated to the best and most loving husband, father, and grandfather that any family could be blessed with, and to all those fighting the battle against pancreatic cancer.